Algorithm Engineering and Experiments (ALENEX12) and Analytic Algorithmics and Combinatorics (ANALCO12) will be held immediately preceding the conference, on January 16, at the same location. If you are tweeting about the conference, please use the designated hashtag to enable other attendees to keep up with the Twitter conversation and to allow better archiving of our conference discussions. 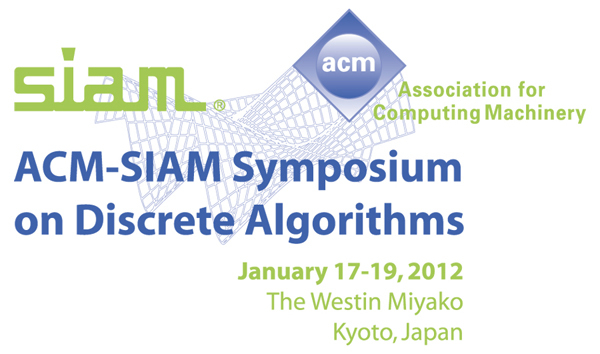 The hashtag for this meeting is #SIAMDA12. Acceptance/rejection notices will be sent to authors via e-mail on or before September 12, 2011.